Der technisch brillante wie formal komplexe 3-D-Style ist das Markenzeichen von DAIM. – und hinein in unsere dreidimensional erfahrbare Welt rückt. bedeuten die vier Buchstaben D A I M plötzlich eine Abweichung zum normalen, mit strengen Konventionen ausgestatteten Schriftbild, welches sich ja doch eher – den Gesetzmäßigkeiten der guten Lesbarkeit folgend – auf die ruhenden Gleichförmigkeiten seiner Formen stützt. Dass es aus dem Nichts entstanden ist und dorthin auch wieder zu entschwinden droht. Wir sehen in einem DAIM-Graffiti das Standbild einer Wortformation, die im Begriff scheint, sich ständig zu verändern, sich dem Zugriff zu entziehen, die auf der Flucht ist, sich nicht greifen lassen und damit also frei, d.h. souverän bleiben will. Mit jedem neuen DAIM-Piece nimmt Mirko Reisser die Welt ein Stück mehr in Besitz;und mit jedem neuen DAIM-Piece nimmt die Welt Mirko Reisser ein Stück mehr in Besitz. “Den Charakter der Buchstaben formen und seinen eigenen dabei entdecken”lautet sein Diktum. Der Charakter der Buchstaben bleibt dabei eine variable, abstruse, kurz: ambivalente (und damit subversive) Größe. Zwischen Konstruktion und Dekonstruktion, zwischen Zwei- und Dreidimensionalität, zwischen Formkomplizierung und Inhaltsvereinfachung, zwischen Hermetik und Kommunikationsangebot offenbart sich in Mirko Reissers Graffiti-Arbeiten der unfassbare Weltgraben – den zu überwinden der Betrachter zusehends mehr ins Grätschen gerät. It makes the characters become tangible. They are shifted from a two-dimensional context into our perceptible three-dimensional world. The implication is that they have moved on to the next dimension, one they do not actually belong to. They push and strive for more; they want to be part of the dynamic world. In an almost courageous way, they demonstrate their overpowering skills, they twist within a space of fantastic colour, interlace, tilt – chopped up, they nestle against one another, join systems of arrows (that point outward into the real world), morph into the depth of the room and then out of it again, stretch in between two vanishing points, collapse, burst, tear to tatters, fragment, literally ‘spray away’. And, all of a sudden, the four characters D A I M become something that is abnormal from the strict conventions of typeface, which (to remain legible) is based on a latent uniformity of its shapes. DAIM’s programme comprises the construction, as well as de-construction of a word (at some point, in between the processes of annealing and erasure, it emerges out of a synaesthetic sphere! And reveals: that it came into being out of nothingness and is always on the verge of disappearing into it again. DAIM- graffitis can be seen as fixed images of a word-formation that is constantly threatening to reassemble, denying access, escaping the demands of tangibility and, thereby, remain free and sovereign. 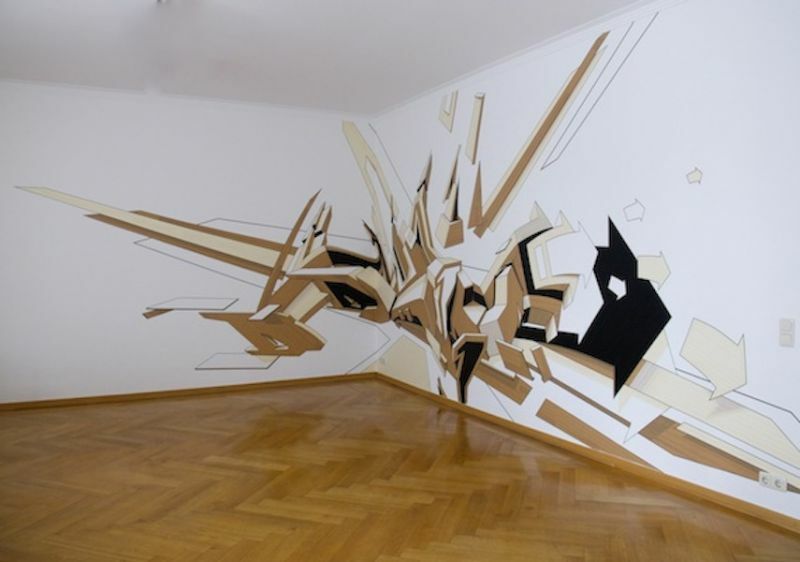 With every new DAIM-piece, Mirko Reisser takes possession of another piece of the world; and with every new DAIM-piece, the world takes possession of another piece of Mirko Reisser. “Shaping the character of letters and at the same time, discovering one’s own” is his dictum. The character of the letters remains variable, abstruse, in short: ambivalent (and, thus, subversive). In between construction and de-construction, two- and three-dimensions, complexity of shape and simplification of content, between seclusion and an invitation to communicate, Mirko Reisser’s works reveal the unfathomable rift of the world – at the crossing of which the beholder increasingly struggles.